SUSAN ELIA MACNEAL: As many of you know, 2013 was the year my mother-in-law, Miss Edna moved in with us and, in October of 2014, we said goodbye. Our son, the Kiddo, bravely and unselfishly let his grandmother have his room, while living in a nook we made from our apartment's dining room (it's a loft apartment, so it's not as dire as it might sound). 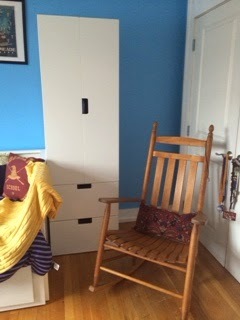 We called his room, made with temporary walls, in jest, "the closet under the stairs," because Kiddo is such a Harry Potter fan. In all seriousness, it was pretty darn nice. 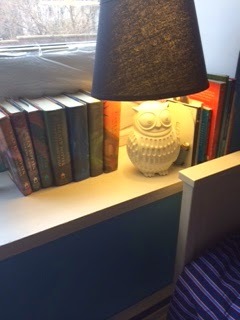 Well, Hubby and I got the idea into our head that a total bedroom makeover was needed before Kiddo could move back into his old room, and decided on a Harry Potter theme. 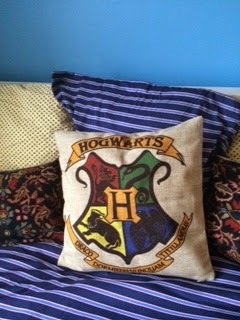 We wanted it less "stuff with logos you'd get at the theme park" and more "referencing Harry's room at Gryffindor." I'm proud to share the results with you. 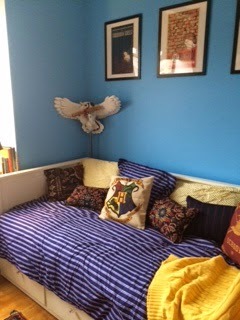 This is the day bed, which makes a comfy place to read and play board games. 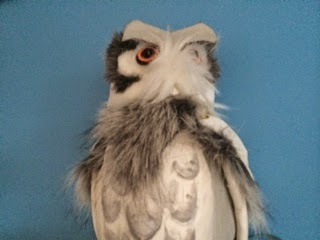 Hedwig, the owl bearing a Hogwarts acceptance letter, was made by Michael Schupbach at Puppet Kitchen. A longer shot of the room, including bunting and Persian carpet. 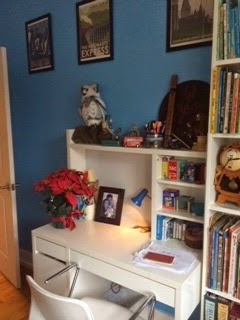 Closeup of the desk's owl, again made by Puppet Kitchen. 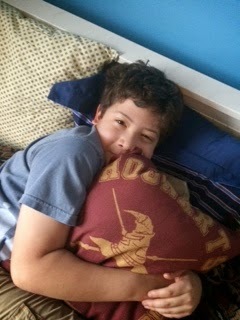 And, finally, overwhelmed and happy Kiddo on his new bed in his new room! And here, at Mattie request, is a picture of him and "Grandmama" aka Miss Edna together. SUSAN ELIA MACNEAL: Reds and lovely readers, what do you think of themed rooms? Is there a room in your abode you'd want to redecorate with a literary theme? And what would you choose? Please let us know in the comments! 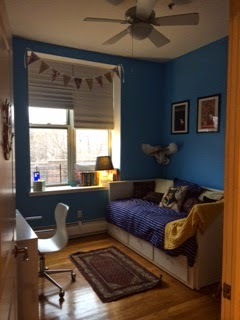 I love this room re-do Susan. As a huge Harry Potter fan myself, I am a bit jealous. I like that you took it to the upscale end and not the kitschy type. The elements you had made are excellent. And you hubby is clearly a very talented craftsman. I am off to my first visit to The Wizarding World of Harry Potter in early February and I can't wait. This post just make me more excited for the experience. What a lovely room. I did my baby nursery in the classic A.A. Milne Winnie the Pooh. Not sure the kids appreciated it, but it made those 2am feedings relaxing. Oh, Kiddo, you are so lucky! Your mama and papa nailed it!! Love themes--done like this. Shudder at those 'themed' rooms--like all butterflies or lighthouses or roses--you get my drift. Themes are fun and reflect what we love--literary themes are the coolest because you have to be a reader to 'get it'! And Kristopher--I am so envious!! Have a butterbeer for me! Goodness, Kiddo is soooo lucky . . . the room is perfect! Me, I'd settle for simply having a room I could turn into a library . . . This is magical! Thanks so much, Susan and the Kiddo for sharing. I'm a huge HP fan, too. Though my office leans more toward Maurice Sendak. Lovely darling boy! You must both be so proud. Fun room too. Thank you all so much! And Kristopher, enjoy your trip to The Wizarding World and have a butter beer for us! That's about the coolest thing I've ever seen. I am jealous of Kiddo! I love the photo of him with Miss Edna. I'm sure I'm not the only JRW fan who misses her. How fortunate that your son got to have her in his life on a daily basis, if only for a short time. 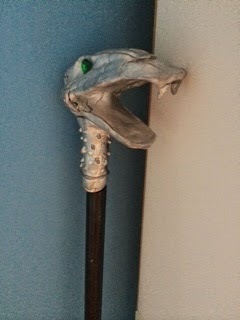 Makes me want to get back to reading Harry Potter books. I've only just begun! What a brilliant job! Your husband is very clever. 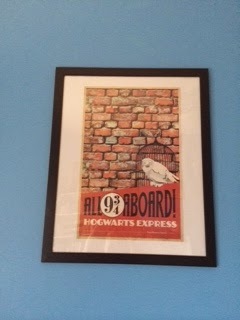 I particularly like the Hogsworth Express picture. Well done all around. What a lucky young man. Oh, Susan, what a wonderful oasis of magical comfort you and your husband have made for your son. 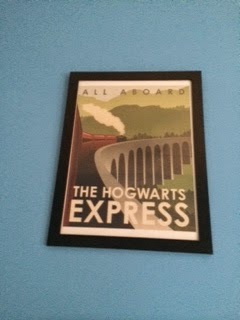 The theme especially connects with me, as my son and I shared the Harry Potter books together from the first in grade school before the craziness really began and through his high school years. Your son, like mine, will forever have a special bond with you all over this. Your husband's work just blew me away. He is most talented! The pictures are simply perfect, too. And, what a great night/day bed with a most adorable boy on it. Thanks for the pictures! Hallie, yes, please do post pictures of your makeover, too. As I type I'm listening to the hammering of new floors being installed in the foyer, living room, and library/office room. I so want to get it right when I put everything back together, especially the little room that we called the reading room (hence the title for my blog)and is now referred to as the little library/office area. I want it to be very literary. Kristopher, I continue to be envious of your upcoming trip, and I can't believe that I let myself miss out on an opportunity to visit the Wizarding World of Harry Potter in September. Arghhhh! What a perfect room. You can tell from the big smile how happy he is. 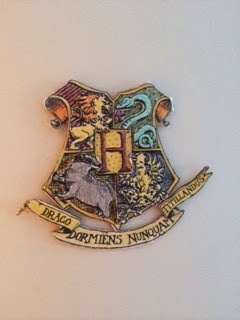 When my granddaughter was about 11 years old she and Grandpa made her playroom into The Harry Potter Room. It wasn't a surprise so they planned it together. She loved it and I think it's only now at age 23 she wishes it didn't have purple walls. She will love these pictures. Thanks for sharing, especially the picture with Miss Edna. My son was temporarily "displaced" when my mom came to live with us and they had a strong bond. I know he is thinking of her when he sings "Rag Mop doodle-ee-doo." Aw, you guys, thank you. I can't tell you how much fun it was to plan and do! Deb, you've only just begun reading the Harry Potter books? How wonderful! You're in for such a great reading experience! You'll have to let us know how it goes! I mean, it was sad, too — but I knew Miss Edna would absolutely approve, so I never felt guilty or anything. She loved Harry Potter, as well, so I think she'd be delighted. We wallpapered our downstairs bathroom with book covers. Every cover on the walls is from a book which has been read by one or more members of the family. Every time a guest goes in there for the first time, they come out asking about the books and who read which one, etc. Fun! I wouldn't mind a Narnia room in my condo. Would you come and make one for me? Oh, and I'm geeking out right now that you guys live that close to Mo Willems. I love this books and have given many of them to my niece and nephew. Great job! Theme without being stupidly overboard with celebrities and brands. Love it. 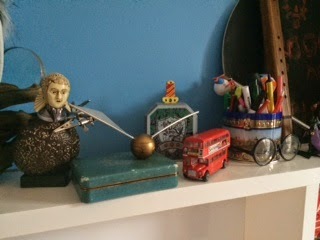 "...a room in your abode you'd want to redecorate with a literary theme?" No, but I have a fantasy of an English country house library with leather chairs, dark wood, a fireplace, books to the ceiling.... I'm working on the books part. I love this room, Susan! So glad that you and Hubby could do this for Kiddo. I'm with Joan Emerson - if I could turn my living room into a library, I'd be happy. Great room. Love the owls and the Crest. He's one lucky kid and I'm sure he knows it. that is the coolest room ever! so lucky to have artistic types in the family. And Miss Edna was lucky have that time with your special family and vice versa. Oh, Susan, I just love this, and love that Kiddo is able to move into Miss Ella's former space, looked on upon by the photo of her and Kiddo in loving embrace. What a sweet way to enter a new phase in your lives. There is a wonderful children's bookstore across the river from Cincinnati, in Ft. Thomas, Kentucky, called The Blue Marble. The shop is in an old house, and upstairs they have a room decorated exactly like the room in Goodnight, Moon. It's so charming, you just want to say, "Hush". Karen, thanks for the info on the Blue Marble. I'm taking my daughter and my granddaughters to Maysville, my hometown and right up the river from you, over older granddaughter's spring break. We plan on doing the Aquarium and maybe the zoo (have been there once with them), so as visit to the Blue Marble should fit in nicely. It's been so long since I lived near Cincinnati, that if you know of any other children's places, please let me know. 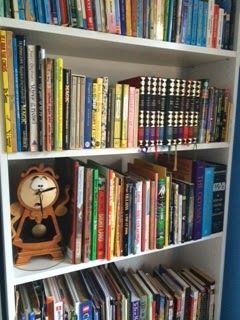 And, Susan, I meant to comment on your proximity to Mo Willems. Wow! 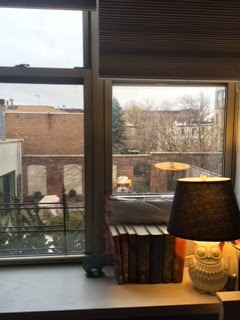 Your son has a Harry Potter room that looks out on Mo Willems' terrace! 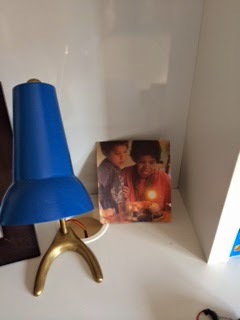 Also, all the little touches to your son's room are just awesome, including the picture of him with Miss Edna. Bev, I love the book cover wallpaper idea! Kathy, definitely go to the Children's Museum at Union Terminal. The Natural History Museum is there, too, and right now they have a display of real mummies. And if you need an additional incentive, the gift shop is fabulous, and there used to be a Graeter's there, as well as an OmniMax theater. In fact, I'd go there and the Zoo before the aquarium, which is a big ripoff, in my opinion. It's very expensive, and there's only one path. The middle part puts you in the food court, and it ends in the gift shop. But kids love the jellyfish and the shark tunnel, and it's right on the river. Also, there's a Barnes & Noble right there--with a nice children's section--and you could have lunch at Tom & Chee. Susan, that is just the coolest room ever!! I want it! And the Kiddo is so lucky. I can't imagine anything more fun for a 4th grader. Or any age, really. If I could do a theme I'd probably (no expense spared) do a room or rooms that looked like Bag End in the Hobbit movies. I love that so much I would go to NZ just to see the set. great job! I'm imagining your son as a full-grown young man. 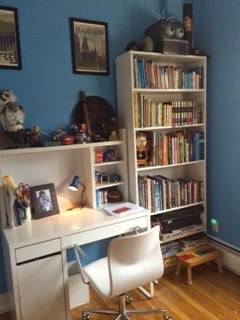 With a larger desk and XL bed this room should take him right up to college and beyond. My husband died in 1991. He was a great nature lover who adored the tropics. There was a tiny bathroom adjoining his office - where he'd be working on the next book, listening to the Giants' game on the radio, and watching reruns of "Get Smart" all at once. Oh, and focussing his binoculars on visiting birds in our garden. After he died, I redid the bathroom into The Edward H. Schafer Memorial Tropical Bathroom. Green tiled floor, wallpaper with green vines, and all kinds of bird cutouts - some as a frieze around the top, others peeking from behind the toilet and so on. When I moved in 1998, I redid the bathroom in my guest suite in the new place. The Edward H. Schafer Memorial Tropic Bathroom, phase 2. Can I come be your kid? Seriously, that is so fabulous. How lucky for him, and how wonderful for you two to be able to give it to him, nurturing his dreams so beautifully. Plus, it won't be hard to upgrade when he hits jr high and gets all mad about race cars or robotics or some other such thing. Susan, I love the Hogwarts theme! I have a peculiar fondness for it having lived for a time at Christ Church, Oxford (Peck Quad 8—2B). Eating in the Great Hall was scary and although unmistakable as the movie showed, I had a hard time eating with the mega-huge-giant portrait of Henry VIII staring down at us... other scary stuff taken out for the Harry Potter Hogwarts. Nevertheless... I love the old style, and if I could have one room to be comfortable in I would design it as a minimalist version of my rooms there with the view… you know—as long as we are imagining. Oh wow, Susan, that's an awesome room. I'm so impressed with your husbands craft skills. I want a book-themed room, which is to say a real library, one with a fireplace and cozy chairs. LOVE LOVE LOVE beyond love.